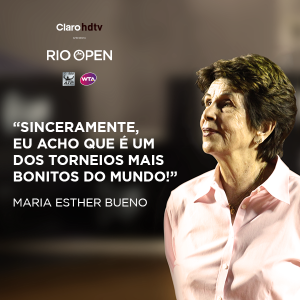 “Sincerely, I think it’s one of the most beautiful tournaments in the world!” Maria Esther Bueno on the Rio Open. 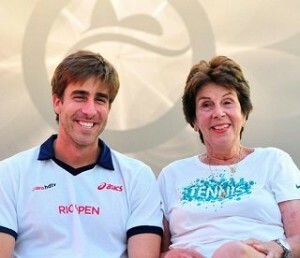 Brazil’s Maria Esther Bueno passed away six months ago and she is still profoundly missed. Now she is being honoured at her home club, the Sociedade Harmonia de Tênis in São Paulo, where a tournament bearing her name was held this past week. It is not the first, however. The International Tennis Federation named the original women’s seniors team event the Maria Esther Bueno Cup for the women’s 50 age category in 1983, when a trophy was donated by the Brazilian Tennis Confederation and the competition was played at Portschach in Austria. 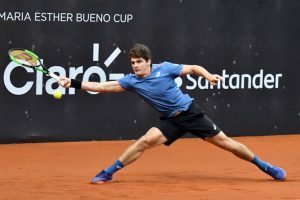 This latest edition Maria Esther Bueno Cup saw players competing for high stakes – a wild card slot in the main draw at the ATP 500 pro event in Rio de Janeiro, the largest tennis tournament in South America, next February. It was also a way to pay homage to the 19-seeded Grand Slam champion while offering real opportunity to young Brazilian players. 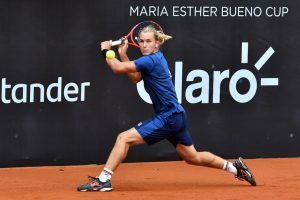 The competition for the best eight young men of Brazilian men’s tennis took place from 22-25 November on Maria Esther’s favourite court, the stadium at Sociedade Harmonia de Tênis. the eighth by invitation of the host club (Lucas Koelle). The players selected for the Maria Esther Bueno Cup were: João Menezes (21), Orlando Luz (20), Thiago Seyboth Wild (18), Rafael Matos (22), João Lucas Reis (18), Felipe Meligeni Alves (20), Gilbert Klier (18) and Lucas Koelle (20). 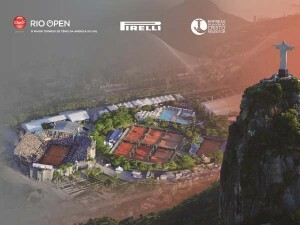 “The opportunity to play an ATP 500 is something that can change the course of a player’s career in this age group,” said Luiz Carvalho, Rio Open Tournament Director. The format of the competition was two round robin groups of four players, with the winners from each group competing in the grand finale. The US Open junior champion Thiago Seyboth Wild and Rafael Matos, both ranked outside the Top 500, won all three of their matches in the round robin stage. In the last match of the group stage, Wild defeated a former junior number 1 Orlando Luz, 6-1 7-5, while Matos took down Fernando Yamacita, 6-2 6-0, to continue his amazing streak. The 22-year-old Matos won one Futures title this year, claiming 28 wins in total but failing to make an impression on the Challenger Tour where he played just one main draw match. Wild, who is 18, played in the qualifying round of the Rio Open this season as well as in the main draw of the Brasil Open in São Paulo, losing to Carlos Berlocq in straight sets. 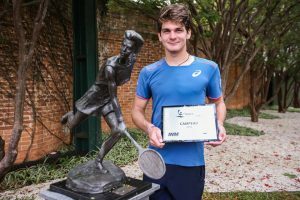 He claimed a Futures title in April without losing a set and played in another final before reaching the quarters in Campinas Challenger in October. Brazil has been struggling to produce a top singles player for a few years, with just four players ranked inside the Top 300 and none currently in the Top 100. In the final it was the youngster, Wild from Paraná, who beat Matos, 6-3 6-4, to win the Maria Esther Bueno Cup trophy and guarantee himself a place in the main draw of the Rio Open next February. Matos came out ahead in both sets, but Wild was able to seize opportunities to turn the match around and close it out. “I want to thank everyone who was here these days, who supported me in the group games, when I was losing, and I always managed to turn things,” Wild said after the awards ceremony. The Maria Esther Bueno Cup will be held again next year, with the same objective of bringing together the best players of the next generation to compete for the Rio Open wild card, providing them with a unique opportunity to play an ATP Tour event. “We had for four days, the best Brazilian Next Gen on the court, with high level matches,” concluded Carvalho, a close friend of Maria Esther Bueno. “The Maria Esther Bueno Cup has fulfilled its objective of promoting, supporting and giving opportunity to young players, in favour of the development of Brazilian tennis. 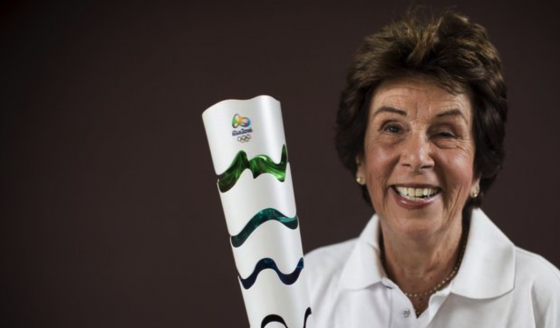 Maria Esther Bueno was a keen ambassador of the Rio Open and attended every event, even the last when she was already very ill, commentating for TV Globo / SporTV. 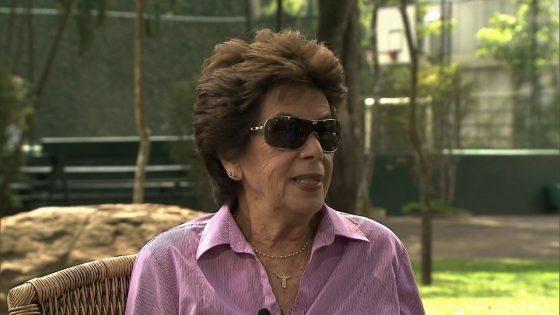 It is therefore fitting that the event honours the queen of Brazilian tennis in the capital of São Paulo, the hometown of this great champion who passed away in June this year, at the Sociedade Harmonia de Tênis, the club she attended throughout her life. 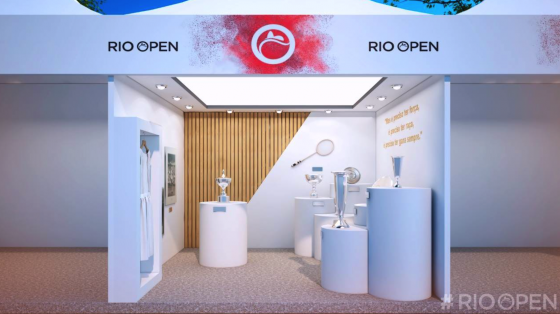 “The Rio Open comes to its sixth edition, consolidated as the main tournament in South America,” said Márcia Casz, General Director of the tournament. “Now, we want to take a little of this experience to other states, starting with São Paulo, since the public of São Paulo has always supported our event. 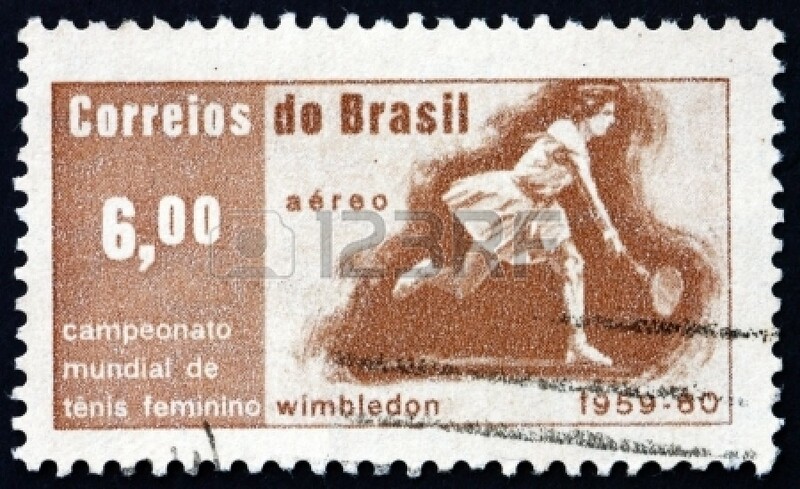 The Rio Open is part of the select group of 13 ATP 500s, and is one of only three tournaments of the category to be played on clay. 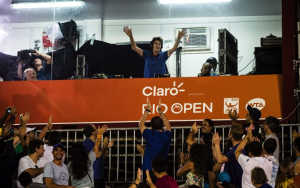 An IMM promotion with ICT, the 2018 Rio Open distributed R$ 6.7 million in prize money to the players and welcomed 48,000 spectators. 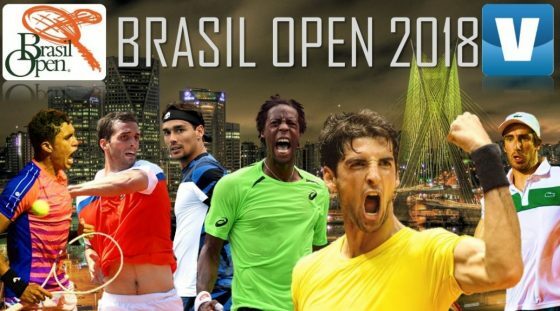 It takes place from 16-24 February at the Jockey Club Brasileiro in Rio de Janeiro, and already has the World No 7, Dominic Thiem from Austria, confirmed in the line-up.